See where your district stands. Complete the survey and gain access to the benchmark results. Yes, with spreadsheets or notebooks. A New Web-Based Solution That Enables District Staff Members To Collaboratively Create Individual Behavior Plans In One-Hour Or Less. 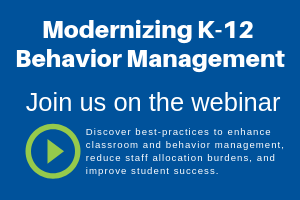 Implement Insights To Behavior To Foster Safer Schools And More Peaceful And Productive Classrooms. Anyone on the student team can open a new case to begin an Individual Behavior Plan in just 2 minutes. Even a novice can reliably assess the student in 15 minutes using the Mini-Functional Behavioral Assessment quiz. Use the guided wizard to uncover Behaviors, Antecedents, and Triggers in 15 minutes. Identify Research-Based Strategies with video demonstrations in 15 minutes. Centralized reporting and an at-a-glance dashboard. Yes, please reach out to me.